Today was a great way to begin another busy week. Bella and I had an impromptu play date with my friend Sara and her daughter Reese and then spent the rest of the relaxing. Bella played so well by herself and actually sat and listened while I read her several books. It was a wonderful Monday. Speaking of my friend Sara... we began discussing preschools and the whole enrollment process. In our area there is one preschool that everyone sends their children to and obviously I want to enroll Bella in this preschool. I know she will be about 2.5-years-old but I think getting her situated in a school environment at an early will be beneficial in the long run. A two or three morning a week program would be ideal and hopefully we can get a spot for this fall. Wish us luck! We wrapped up our day with an early bath and a movie. Ian worked late and had dinner plans so I pulled dinner and bath duty by myself. I promised Bella we could watch a movie and she selected Winnie the Pooh. 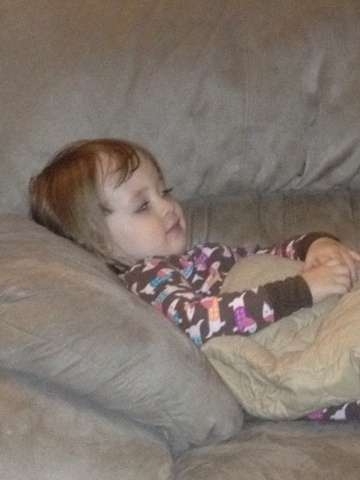 So while I'm blogging, she is chillaxin' on the couch, just watching her movie. Again... It's been a wonderful Monday!